Very reluctantly on Thursday morning, we left our place In The Woods, to begin the two-day drive back to Bisbee to pack up most of our stuff and move. The drive down through California’s Central Valley was uneventful, and I-5 was boring but fast. Then we hit L.A. about 7:30 p.m. The outlying highways to the north were actually smooth going by that hour, until we encountered a short delay caused by an accident. Cat Rupert surprised us by being relatively calm, cool and collected during the trip. We didn’t have to give him tranquilizers or put him in a cage as we had done on the trip out to California. Maybe he’s finally getting the idea that we’re NOT taking him to the vet or to the animal shelter. After visiting a friend in Tucson overnight on Friday, we arrived at our house at noon Saturday. The shacky building suspended over the creek expressed its displeasure at our long absence by cutting off the electrical power to the “showroom” side, shortly after we arrived. Then the back door stuck; it’s been very rainy over the past six weeks we’ve been in California. Then the creaky wooden chair on the front porch (painted red, of course!) fell apart when James sat on it. Then the refrigerator door refused to shut because the kitchen floor has sunk a little more on one side — the whole house tilts downward slightly towards the street, and continues to “settle” as it ages. It’s nearly one hundred years old, after all. threatening to choke the life out of the two peach trees. Thank goodness it’s not hot as blazes at the moment! 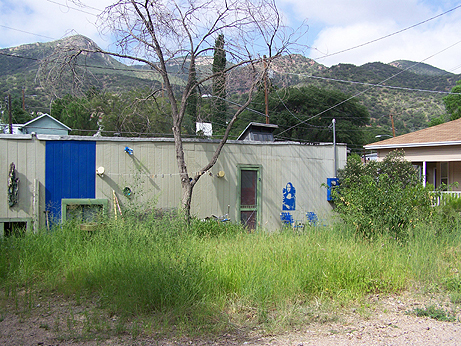 Bisbee seems to be at the tail-end of monsoon season; cloudy and humid when it’s not raining. The overcast skies keep the temperatures relatively low. James has already packed up the bedroom and started on the livingroom on the “apartment” side of the building last night, which includes a small kitchen. I have been packing books in the library and will soon move on to all the miscellaneous junk and various musical instruments also stored on the bookshelves. We pick up the rental truck on Wednesday and will load it up over the following two days, and will leave Bisbee on Friday. We have to be back up at The Woods by Sunday. We will move our Airstream trailer from the RV park on the town’s little main street to the barn on the land (at last! the moment we’ve been waiting for!) on Monday, and the well-drilling company comes on Tuesday to install the pump and pressure tank, so that we will FINALLY be moved up there. 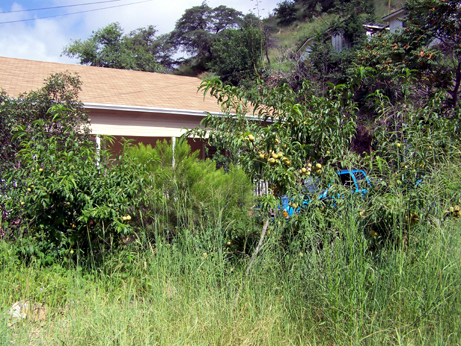 A massage therapist friend here in Bisbee is interested in our house. We truly hope that he will buy it! That would be wonderful. The place is zoned commercially, so he could have his business on the “showroom” side and live on the apartment side. We’re keeping our fingers crossed. “Powers that Be”, please give us the strength to get through this week! 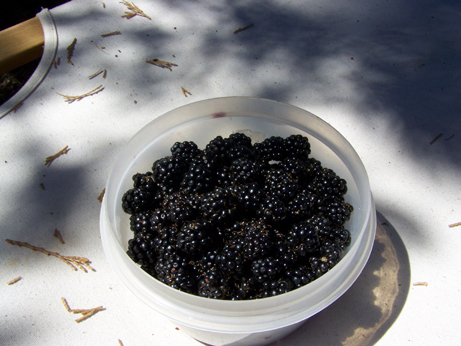 Before we came down to Sacramento to dog-sit my brother’s dog, I spent nearly three hours picking blackberries on the land. Near the barn is a huge cedar tree, with a smaller deciduous tree entwined with it. At the bottom of these closely-combined trees is a large blackberry bush, which spreads out on every side. For the past few weeks, I have monitored the gradually ripening fruit. They’ve gone from pink to red to nearly black, and a good-sized crop was finally ready to pick on Sunday. I’ve never picked blackberries before in my life. At first, my choice of apparel was wrong, wrong, wrong. 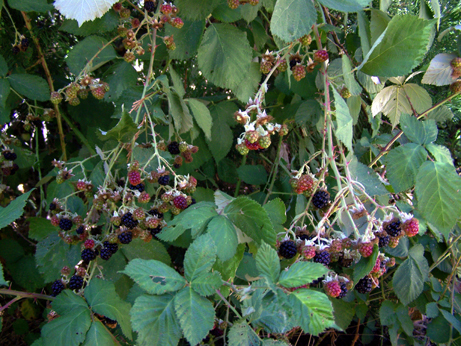 As soon as I saw that the berries were ripe, I immediately began picking. Unfortunately I was clad in just shorts and flip-flops. What a city slicker! It soon became apparent that I needed more protection from the brambles and stickers, so I changed to long pants, long-sleeved shirt, hiking boots and then donned a pair of gloves. Some of the blackberries looked ready to pick, but in fact were not. I quickly learned how to gauge how easily they came off the vine. If there was any resistance at all, I left them to ripen for a couple more days. But many berries practically dropped into my hand without effort. Juicy, sweet, so full of flavor. What a rush, and a surprising source of entertainment! The simplest things are often the best. I really got into picking. I searched the dilapidated bunkhouse kitchen for suitable containers to hold the increasing bounty, and found one plastic bowl without a lid. After this was quickly filled, I went back and rifled through an ancient wooden kitchen cabinet and came up with several dusty plastic “Big gulp” beverage cups hiding in a dusty corner. After I rinsed them with a little bottled water, these too, were filled to the brim. I had a sh**-load of blackberries! We gave one container to the owner of the land, our dear friend L. in Nevada City, on our way down the hill to Sacramento. She was thrilled, and said that the blackberries would taste wonderful with mango sorbet. I’ll have to try that! Another container went to my brother and his wife, who took them up to Arcata the next day when they visited their daughter. For dessert that night, James and I had blackberries with lemon sorbet, which just happened to be in the freezer. Yum! There was still plenty left over for blackberry jam. James has an extremely easy recipe, using agar-agar as a thickening agent, and stevia root powder for sweetener. Since there are no preservatives, it has to be kept in the refrigerator (or freezer). No problem there, since we’d scarf it up soon enough anyway. We had blackberry jam spread over toasted sourdough bread this morning and it was HEAVEN. I think I’m going to like living in the woods. Very much. This land’s main drawback, the one critical item which has been missing is the presence of WATER in the barn/bunkhouse/studio. In former years, water was pumped into this building by a small spring bubbling from a tiny fissure on the side of a nearby mountain. All the houses and cabins in the neighborhood were serviced by this spring. Our land was the last in the downhill chain of houses to get this water. But over the past six years, the spring has slowed down, and one by one, the local residents have had wells dug on their property. A few weeks ago, when James and I arrived on the land this second visit to California in as many months, he tried to connect plastic pipes to another spring which is much closer to our barn. Unfortunately this water source is a few feet below the barn’s elevation, so there’s no way to get the water up here. We finally decided to have a well dug on this property. 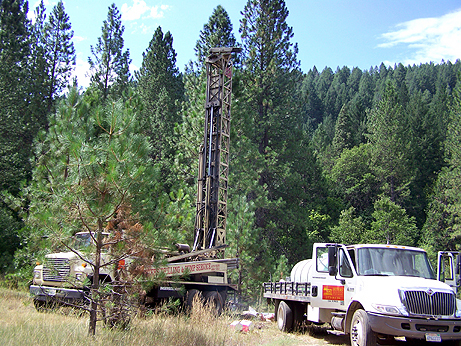 We called the same well-drilling company that the other neighbors have used. They arrived this morning about three hours ago, and already they have struck water at 120 feet! But there are complications; they’ve also struck slate and sand, which means that the well will have to be lined with two layers of plastic or failing that, metal. This will add to the cost, but “oh well”. We gotta have water! I’m not sure of the technical details but I will keep you posted. After the drilling is completed, they will install the pump, situated closer to the barn. The actual well is not far from the building; it’s slightly uphill which is good. After all is in place, James will run various pipes to the barn, summer kitchen and bathroom. Then we will be able to bring our Airstream trailer up from the RV park on the town’s main street, and FINALLY be able to live on the land full-time! It’s been somewhat of a drag to have to go back down the hill every evening to shower and eat and sleep. Our cat Rupert also misses us when we’re gone all day. We hope to be completely settled up here in a couple of weeks.